Orthodox cathedrals with their trademark golden onion domes are a familiar sight across Russia. And one may soon become part of Paris's famed skyline, near the Eiffel Tower. French President Francois Hollande has just weeks to decide on a controversial plan to build a massive Russian Orthodox Spiritual and Cultural Center in downtown Paris on the banks of the Seine River, on a UNESCO-protected world heritage site. The project is staunchly opposed by Paris Mayor Bertrand Delanoe, who has described the architecture as "pastiche” and "mediocre." 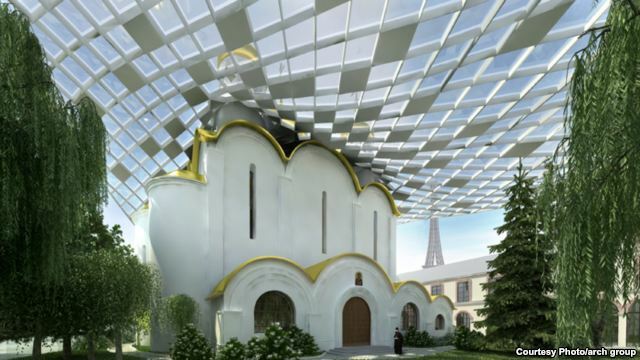 But Moscow is reportedly putting diplomatic pressure on Hollande to approve the project and allow construction of the golden-domed, white limestone and glass structure to proceed. In 2011, the online real-estate television station La Chaine Immo announced plans for the cathedral with enthusiasm, describing the building as a "happy marriage between tradition and modernity." According to the report, architect Manuel Nunez Yanowsky's design comprises "two buildings dominated by five bulbs, one of which will be 27-meters high. An immense glass veil will serve as a roof and a 3,400-square-meter garden will be open to the public." However, opposition to this ambitious plan has quickly mounted in the French capital, where preserving the integrity of the city's famed architecture is taken seriously. In February of this year, Delanoe called on UNESCO to prevent the project's authorization. In response, Viktor Khrekov, a spokesman for the Kremlin Property Office, said Delanoe was only expressing "his personal opinion," which "has no legal significance." The reported deadline for Hollande to make a decision is November 29. With this red-letter day looming, the president finds himself on the horns of a dilemma. As the French weekly "Journal du Dimanche" reported on November 11, he could either defy Delanoe, a close political ally, or risk straining diplomatic relations with Moscow. The weekly added that Aleksandr Orlov, the Russian ambassador to France, has been calling officials nonstop to press for the project's approval. Adding to the pressure, the cathedral is expected to be on the agenda when Russian Prime Minister Dmitry Medvedev visits Paris for talks with Hollande on November 27, just two days before the deadline. On November 12, Delanoe reiterated his "aesthetic" opposition to the project, telling journalists that it would create a "bad image" of Russia and Orthodox religious authorities. 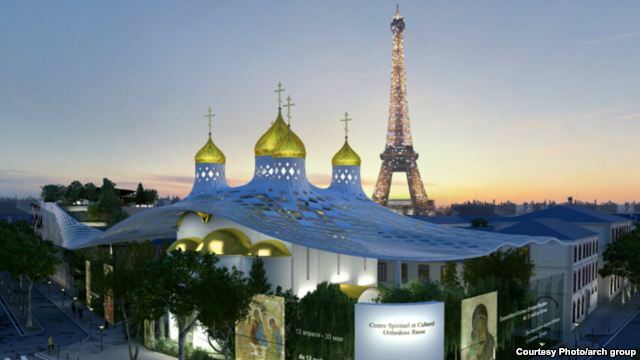 In what appears to be an attempt to find a compromise, the French Culture Ministry says it is holding talks with Russian government and Orthodox Church officials to identify "adaptations and improvements to the project to permit its construction." "I really don't know what's going on," he said. "I suspect the project has changed a lot. How it has changed, I don't know. I don't know how much the building that is meant to be built corresponds to the original concept. Perhaps the two are exactly the same or perhaps they have changed it completely." In 2010, Russia reportedly spent 70 million euros ($91 million) on the 4,500 square meters of land where the cathedral is to be built. An official request for construction was filed in January 2012, with total costs estimated at more than 30 million euros. According to French media reports, the idea for the project, aimed at promoting "Russian civilization," came directly from President Vladimir Putin. In a 2010 interview, Ambassador Orlov described it as "unique by its location and its nature." He noted that tens of thousands of Russians live in or near Paris and that a "strong symbolic place" was needed for them. Paris’s Aleksandr Nevsky Cathedral currently houses the archbishop's palace of the Russian Orthodox Churches in Western Europe. At least two other Russian Orthodox churches are located in the French capital.